I’m a food blogger, so obviously I enjoy cooking. But finding the time for it is another story. With a busy toddler who has an early bedtime, I need to get dinner done fast, with as little prep as possible. The best solution I’ve found is to prepare our meals for the week on Sunday. I plan our menu first thing in the morning, then go grocery shopping; after lunch, I get in the kitchen and start cooking. During this time, I prep and cook meals for the entire work week, and usually at least one lunch food and one breakfast for my daughter too. With a little organization, this is completely doable—and now that this is my routine, I can’t imagine cooking any other way. Here’s how I do it. Something I can make in the slow cooker. Something I can make on the stovetop. Something I can prep, put in the fridge and cook later. Something that requires no cooking. Something that can be baked in the oven. 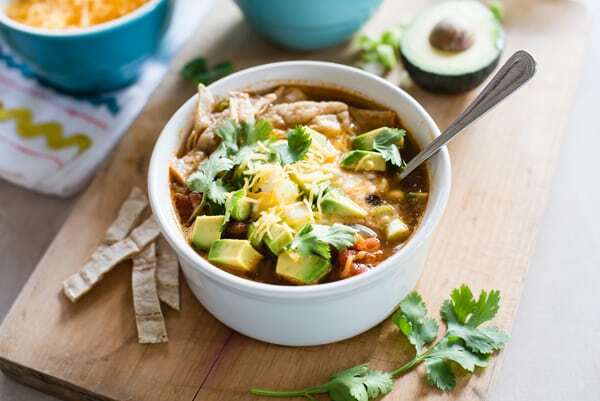 I also plan 2 recipes that can be frozen for Thursday and Friday, since I don’t like keeping foods in the fridge for an entire week—usually the stovetop and slow cooker recipes are good candidates for this, since they’re often soups, chilis or stews. If I can double the freezer recipes, even better. Creating a stockpile of food in the freezer means I can take weekends off from cooking once in a while. To minimize prep time, I do my best to choose recipes that have common ingredients—broccoli for a stir fry and broccoli for a casserole can all be chopped at the same time, for example. The grocery shopping part is pretty self-explanatory. I organize my list according to the layout of the store to make things easy for myself; since I plan recipes with overlapping ingredients and foods we already have on hand, I often only need 10-15 items at the store—sometimes even less. I get all the chopping and slicing out of the way first. I have a huge cutting board and I scrape all the scraps to the side as I work. Then I put the scraps in a freezer bag to make vegetable stock with later. When I had a larger kitchen, I used to pull out all of the remaining ingredients from the pantry and fridge at this point and group them by recipe on the island. With a smaller kitchen and no island, now I just take out what I need for the first recipe I’m tackling, then once that’s done, I put away anything I won’t need for another recipe and pull out what I need for the next. If you’re making a slow cooker recipe, start with that because it will take the longest to cook. Next, I usually make the recipes that don’t require cooking and that can be prepped and cooked later. The no-cook recipes are typically salads or raw spiralized dishes—I chop lettuce and put it in one container and other veggies go in a separate container. The dressing goes in a third container, then everything goes in the fridge and our first meal is ready to go! I’ll often make a casserole for the prep-and-cook recipe—French toast casseroles, stratas, lasagna and other pasta bakes are all good candidates. They may require some cooking before assembling—sautéing veggies or boiling pasta—but you’ll do the actual baking of the finished dish when you’re ready to eat. Pasta bakes will usually last 2 days prepped in the fridge, but French toast and stratas should be baked the next day. The remaining recipes I make in no particular order. 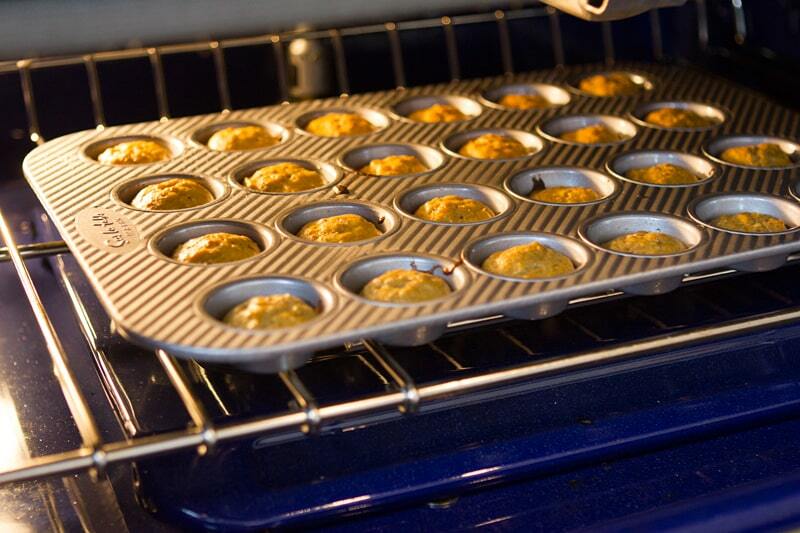 Because we have a double oven, I’ll make muffin tin breakfasts or lunches, baked French toast sticks, or oatmeal bakes for my daughter’s breakfasts while working on weeknight dinners. We don’t have the wall space for a traditional double oven, so I love that KitchenAid makes ranges with double ovens. I can cook two meals at the same temperature in the larger bottom oven and another in the top at a different temperature. 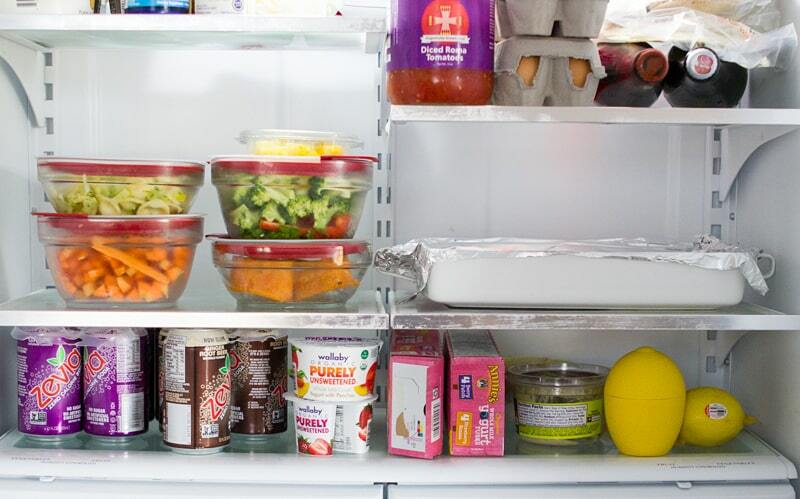 Once you’re done cooking, it’s time to put all those delicious meals in the fridge and freezer for later. You’ll want to have foil, plastic wrap or Bee’s Wrap, zip-top bags, and storage containers on-hand for this. Let cooked foods cool slightly, but not all the way—if they’re too hot when you put them in the fridge or freezer, they’ll warm up the foods around them, which isn’t good! But if you let them cool too much, bacteria can breed. Soups and stews can be frozen flat in zip-top freezer bags. 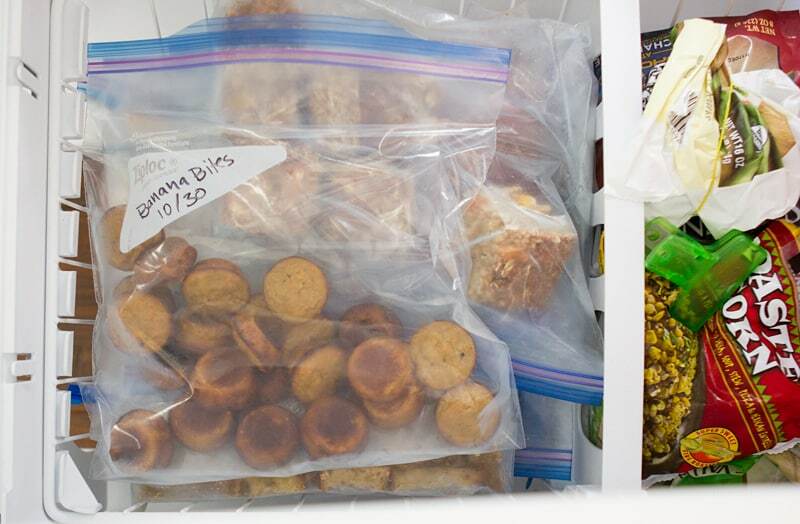 For my daughter’s finger food frozen lunches and breakfasts, I line a baking sheet with parchment paper, put the food on there, freeze it for an hour or two, then transfer them to a freezer bag—this keeps them from sticking together. I have an entire section of our freezer devoted to freezer cooking—the deep drawer in the bottom of our KitchenAid French door fridge is awesome for storing it all. 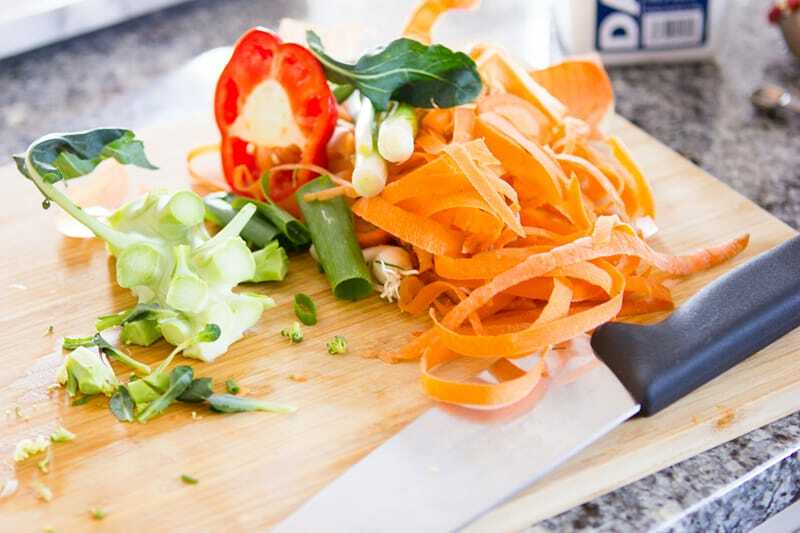 Okay, this is the worst part, but here’s the good news: you have a lot of clean-up to do today, but having your meals ready in advance means your kitchen will stay spotless the rest of the week. All that cooking you’ve just done means you’ll probably have a sink full of dishes to wash—and probably a whole mess of them on the counter too. So! Many! Dishes! The dishes used to be my most-dreaded part of this whole cooking-for-the-whole-week thing, but we’ve finally gotten a dishwasher that actually cleans all of our dishes without having to pre- or post-rinse. 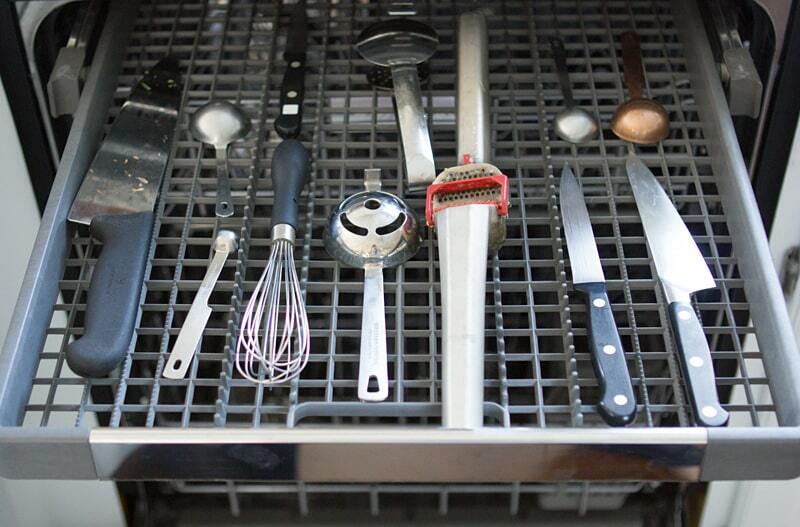 The Third Level Rack is perfect for all those miscellaneous kitchen gadgets and knives. After cleaning out all the dishes, I wipe down the counters and stovetop—if you don’t have granite countertops, this homemade counter cleaner is perfect for loosening any dried up food bits and stains and sanitizing everything. All the hard work is done so you can totally coast through the rest of the week. Yes! The prep-and-cook casserole can almost always be cooked at the same temperature and time listed in the recipe. For anything you’ve frozen, it’s best to let it thaw in the fridge the night before; when it’s time to eat, you can heat it on the stovetop or in the microwave. If you’ve frozen your food in microwave-safe containers, you can thaw it in the microwave instead of the fridge—this is always a nice option if you forget to take things out the night before. KitchenAid provided the appliances for my kitchen, but all opinions in this post are my own.